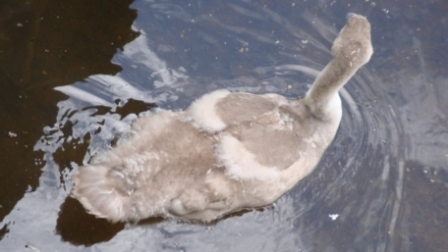 I caught an up-close glimpse of one of the cygnets recently. 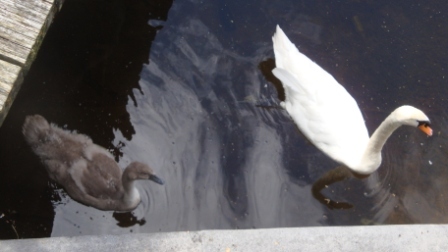 This parent/child combination was near the original nest by the cathedral. I’ve yet to determine whether this is a separate, smaller family or simply a place where one parent takes a member of the other group of three cygnets for a time-out or some one-on-one. The children are growing fast, yet their wings are still not fully developed so they cannot fly (for anywhere from two to five months after birth). You can see the snowy white crescent moons on the back as they continue to sprout. It will take at least a year before they molt to lose their grey feathers and grow completely white ones. By that time hopefully there will be a new crop to monitor. For such beautiful creatures, it’s interesting that one of the names for a group of swans is lamentation. Could it be humans lamenting they lack the grace and elegance of these majestic birds? As a self-proclaimed duckling who will never achieve that kind of adoration, I would be inclined to consider that a viable origin. 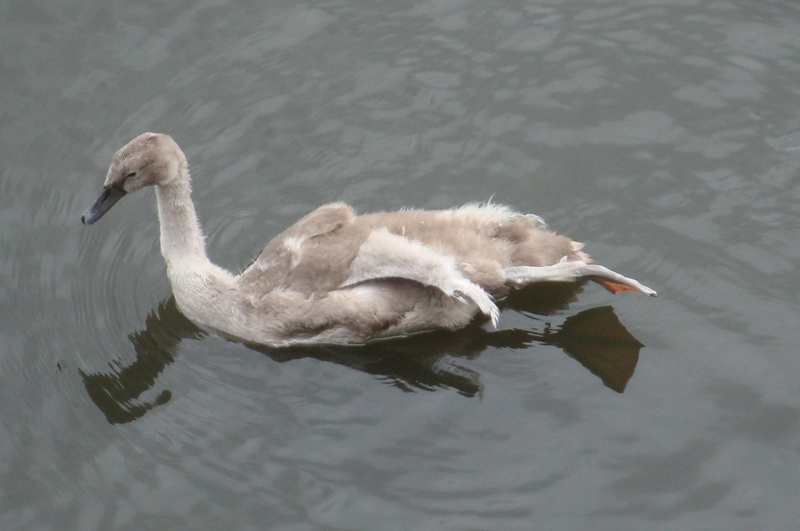 7/22/2012 Update: I found the swan family down by the Claddagh and one of the cygnets kindly extended its still forming wing in a wave.